Gorgeous art deco cruiser! 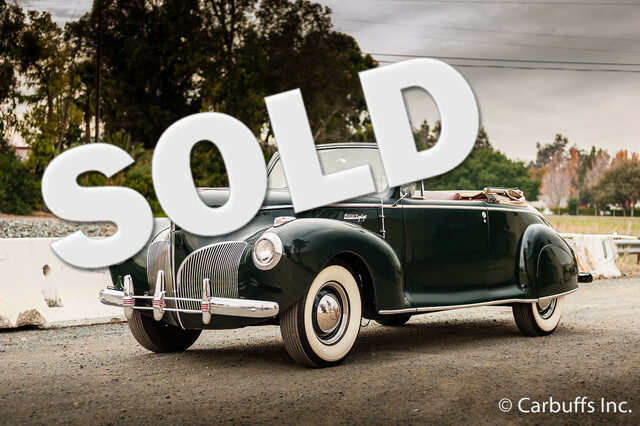 This Lincoln Zephyr is #52 of only 725 convertibles manufactured in 1941. Original color combination of spode green exterior with tan leather interior. Gold plated instruments look perfect in the woodgrained dashboard. Tan power convertible top/glass rear window is in excellent shape and works properly. All gauges work great including the speedometer. Beautiful and straight body. 292 ci 125hp V12 with cast aluminum heads and 3 speed manual transmission runs and shifts as smooth as can be. This car received a 6 year no expense spare restoration from 1998-2004. The cost was just over $100k. Everything was rebuilt or replaced with new as needed. Large stack of receipts included. The only items I can find that may need attention are the radio, heater and clock. Runs and drives great and is ready to show. Clean California title.